The garbage truck will be here soon. I know I look crazy: a middle-aged man in his bathrobe and slippers standing out by the curb, but I have something to say. Every soldier deserves a funeral and dammit, my ottoman will have one. I wasn't the only one who ever loved you. First, there was Shelby French. We were fourteen, and used to sit on you together in my parent's den. Shelby had light blond hair and steady blue eyes, and as we listened to Dark Side of the Moon, her pale bare foot tapped and swung to the music. A few years passed, and I was sixteen. Along came Danielle. We left you, ol' buddy, and moved onto the couch so we could stretch out. Danielle had brown curls and freckles. She smelled of bubble gum and soap, and occasionally let me get to second base. Then there was Sade. We were nineteen and living on our own for the first time. My parents gave us their old furniture. 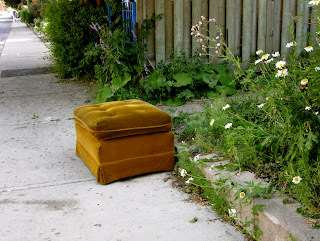 Hey, ottoman, do you remember our bachelor apartment? It was cramped and scented with Indian food from the restaurant below. Years after we moved out, your fabric still smelled like curry. Lisa made me keep you in my "man cave," in our basement. Do you know what a man cave is? It's a manipulation tactic women use to keep everything they hate of yours in one place. She hated you, ottoman. I'm sorry to admit it. But if Lisa loaded the gun, then my wife, Jenn was the one who fired it. Yesterday, I found you out here by the curb. "It's hideous," she said by way of explanation. And there was no discussion, no pleading from my end. Did I give you up too easily, ottoman? After all we've been through? I can hear the garbage truck rumbling up the street. It's almost time. Goodbye, old friend. Rest in peace. Your creativity is truly inspiring. Just.diggin'.it. Cheers so much. Wow, thanks. Your comment was the best part of my day!